Here would be my ignition circuit for switching a Vicor DC/DC converter and a MiniBMS charger output. Edit: Should have completely tested this before posting. It's not ready yet so I've removed the link. Last edited by DaveAK; 28 February 2011 at 2232. Mine is on my website, but I just updated it to include the BMS and a few other odds n ends. Nice Job Noah. I've been trying to figure out a way to get the start switch to work the contactor as well. I may steal some of your ideas. 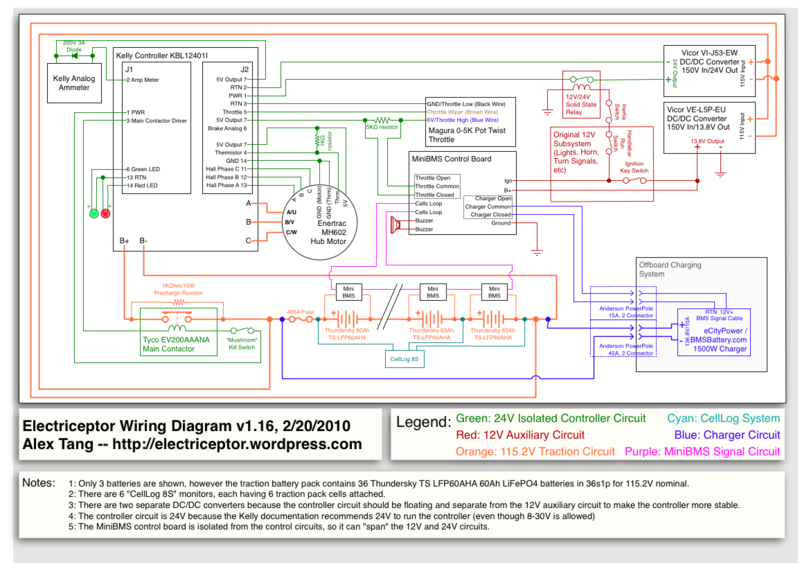 As for my wiring diagrams, I wrote up on my blog a post on the various wiring diagrams that i've been evolving for a while. The posts are located at http://electriceptor.wordpress.com/2...ring-diagrams/ and a second post at http://electriceptor.wordpress.com/2...ring-diagrams/. I've used these diagrams as a way to ensure that I understand where everything is going to go, and whenever i change how i think i'm gonna do it, i change the diagram. I'm pretty paranoid about setting fire to the garage, blowing things up, etc. Here's my laatest diagram. I'd love to hear any suggestions. No problemo - steal away. I think your Tyco contactor takes 9-36V, so you might not need the 450 Ohm, 20W resistor on the start switch relay. That resistor is there so that the relay only sees 12V across the coil (which is 85 Ohm). Not sure what the Kelly puts out to the contactor coil, you'll just need to choose a resistor value that puts 12V across the relay coil. Also, the "Armed LED" isn't necessary for the circuit to work - I just have that because I like a visual indicator that the contactor is closed. Thanks! I'm still looking over your diagram, so i'm sure i'll have questions later. Noah, also, where'd you get the latching relay? Got a maker and model number handy? And even more questions...From your diagram, your key switch can handle 80V? Really? Did you use the original key switch or something else? you can use one with multiple contacts and have it supply itself power.... so it self latches. It's a plain old 12V automotive relay from Radio Shack. It's the circuit that makes it self-latching. Here's a diagram of just the latching relay circuit. The only difference is the 450 Ohm resistor I need to maintain 12V across the relay coil. It's the original key switch. It can handle it because the switch doesn't actually see 80V - since the switch has nearly zero resistance, most of the voltage is across everything after the switch(es). Only need to be sure the switch can handle the current, which is pretty small. I noticed on your diagram that the DC-DC converter isn't isolated. I decided to use an isolated converter because on my scooter I've got bits of the 12V circuit grounded to the frame. I'm not 100% sure that this is a problem but you might want to double check. Unless you're not using the frame to ground things.